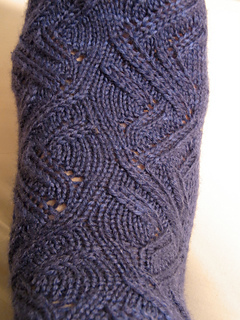 UPDATE 10/23/2011: Pattern revised to include easier-to-read charts and instructions for 64-st and 72-st sizes. These are to be a thank you gift to a friend at my horse barn who has been very kind to me over the past couple of years and who has greatly admired my knitting when she’s seen it. 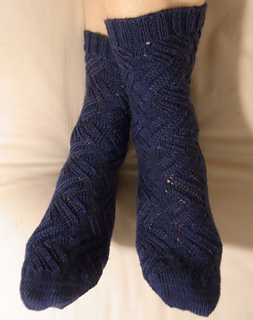 I feel she is among those who would really appreciate some hand-knitted socks. Her favorite color is navy blue, and one of her horses’ names is Gretya. Hence the color/name of the socks. 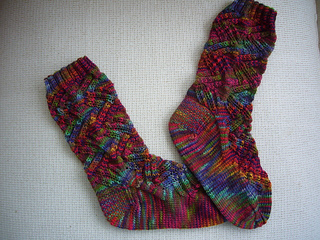 I designed these on a recent trip, they are top-down socks and work up very quickly. Simple yet interesting pattern that I think will show off all yarns, from solid to very colorful. Enjoy!